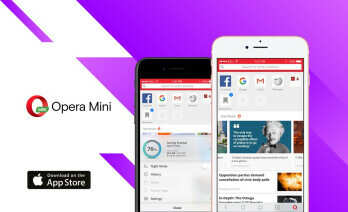 In preparation for the launch of the Apple iPhone 8, Opera has just announced an updated version of it's Opera mini browser. The app has received a total makeover to further improve the browsing experience of iPhone users. The updated version of Opera mini browser for Android features a redesigned interface, the search and address bar have also been dressed in red. Aside the new colour change, the address bar has also received new improvements like the ability to customize the search engine and also option to scan QR codes. In other to make accessing the headlines a lot more easier and faster, the top news will now appear on the top page, the browser is alao now more efficient as it can load up full news 4 times faster than before. Another major improvement is the addition of AI-powered newsfeed. This gives Opera Mini users a more personalized start page each time they use it, which means they won't have to customize or set it up. The new AI-powered newsreader is currently available in few selected countries like Ghana, Kenya, India, Indonesia, Nigeria, South Africa, Tanzania, and the United States. Opera plans to make it available in other countries like Russia, Pakistan and Bangladesh soon. Lastly, Opera claims that this is just a few of the numerous changes they plan to bring to the app. So expect more new features in the coming weeks/months.